A “topping off” ceremony for the long-planned Sea­Glass carousel in Battery Park is scheduled for April 18. 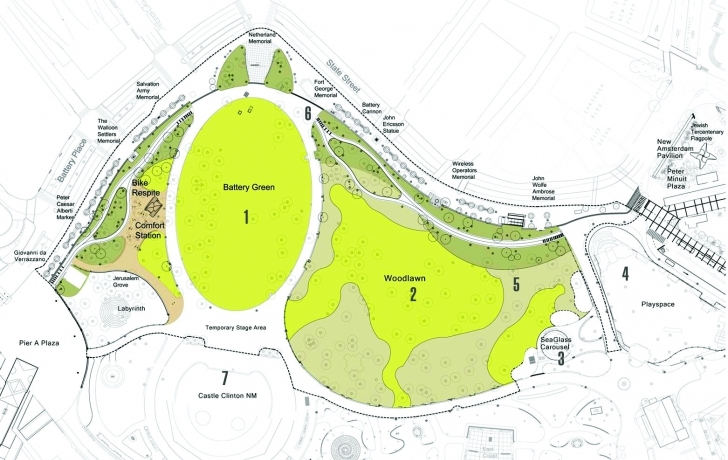 It is the latest milestone in the transformation of Battery Park and the realization of a 1988 master plan funded by the Battery Park City Authority. The plan took on life in 1994 with the creation of the Battery Conservancy, a public-private partnership modeled after the Central Park Conservancy and led by Warrie Price. The conservancy oversees the renovation and reconstruction of the 25-acre park, which includes Peter Minuit Plaza. Last month Price gave the Trib a tour of the park and provided an update on what is there and what is to come. Here is her commentary. This three-acre area at the Broadway entrance to the park, on its northern end, will be programmed for lunches, sunbathing, relaxing and it’s also where we’ll present concerts in the temporary stage area. It is supposed to be completed by next fall. This is going to be our Sheep Meadow. Five thousand people are going to come for outdoor concerts. Those years where we’d have the River to River Festival, Dancing Under the Stars, all of that will now have a truly wonderful place. Look at all of the sense of openness. And I don’t think we’ve ever been able to present Castle Clinton National Monument the way it truly deserves; we’ve never had an unobstructed view to the castle. There should be a sense here that this is our public, unprogrammed space—it’s for all of us to do whatever at the moment we feel is what we want to do. The woodland, which goes all along State Street, is seven acres. It has a major pathway connecting to Peter Minuit Plaza and the castle. We’re the only mature woodland that exists Downtown. Eighty-eight trees were taken out with the Number 1 subway excavation, so we are going to plant over 100 new trees. Kids in New York who will never get to scuba-dive or snorkel will have this incredible imaginary aquatic ride. It’ll carry a maximum of 32 riders at a time on four turntables and the rides will go for two to three minutes each. Eighteen figures go up and down and then move side to side. Water elements will be projected onto the walls where the spiral ceiling is, so you’ll feel like you’re in the water. As that ribbon of roofing goes around, there will be projections of sea scenes. The music is going to be specially composed. The fiberglass figures themselves are lit from within. They should look like seaglass, which is glass burnished by the sands of the sea. Inside the fish, there are fiber-optics that change color and move, which fish do in the wild. These are monumental fish—I’m talking about nine-by-nine! Frank Gehry has created a wonderful playground. It will be over an acre, the largest playground Downtown. We have a base of money, but we need to raise quite a bit more. I’m going to try to raise it privately. It’s still [too] early to say how much it will cost. When it will open is all money-dependent, but it’ll be a year of construction. The urban farm has been loved by so many Downtowners—they now know the Battery is for them. It began in 2011. It was our first educational and horticultural outreach to the community. We get many volunteers to our gardens, but this program really engages children and their families. We had 1,800 children last year from 11 different schools. It’ll move inland from where it is now, because part of the bikeway is going to be where you see the farm right now. We want to increase the farm and do cooking there. Everyone keeps asking, ‘How did the gardens come back after Sandy?’ We’ll know for sure in the spring, but we did everything that we knew New Orleans did post-Katrina [to protect them]. The bikeway goes on the inside of the park and on the other side of the subway station. It goes around Peter Minuit Plaza, over to the Battery Maritime Building. People ask me, ‘How are you going to slow [the bikes] down?’ I said, ‘We’re going to stun them with beauty!’ People will just see a crowd, and they will modulate their velocity. See the curves? You really can’t pick up a lot of speed—and why would you want to? You’re in a paradise here with beautiful plants! We have a partnership with the National Park Service to revitalize and rebuild Castle Clinton and we are still working with the Park Service to get its approval. The concept by Thomas Phifer was selected in a competition in 1999 and calls for bringing the castle back to the period when it was a performance center within the historic walls—a 21st-century piece of architecture. There will be a stairway on the outside of the building that will encircle the concert venue, so you’ll have wonderful views of the harbor as you walk up. People loved the free concerts on Thursday evenings in recent summers. And that’s what the Park Service wants to do—that’s what we think Downtown should have, an intimate waterfront performance venue within this historic structure where Jenny Lind, the Swedish Nightingale, debuted in 1850.